GAFCON was held at All Saints Cathedral in downtown Nairobi. Serving as the National Cathedral for the Anglican Church of Kenya, All Saints has 13 worship services each Sunday with over 6000 worshippers: 800 children, 500 teenagers, 800 youth, and 4000 adults. This dynamic congregation offered numbers of its members as volunteers to serve and help us all week. Not only does this urban campus have a state of the art auditorium which housed our large gatherings, but its historical buildings and beautiful grounds made our visit to Kenya very inspiring. Many of our brothers and sisters are living the reality of this Hymn right now. How many arches can you count? I can see 10. Here are some of our folks from the Anglican Church in North America who were present in Nairobi this week. GAFCON2 has emphasized the Church returning to the priorities of discipleship and mission based on the Great Commission given by Jesus in Matthew 28:19-20. All throughout the GAFCON meetings this verse has been repeated over and over again. Even the host of wonderful volunteers sported T-shirts with the verse written out for all to see. Amidst the week there were mini-conferences focusing on different areas of interest which attendees could choose to participate such as The Holy Spirit, Witnessing in Your Culture, The Godly Woman, Marriage and Family, and Understanding and Impacting Islam. I chose to attend one designated for bishops and it focussed on leadership based on an exposition of Hebrews 13. This was a great time of rethinking leadership and our call to be shepherds of the flock. We were given an excellent booklet by Bishop Wallace Benn and published by The Latimer Trust entitled, Remember your Leaders. The bishops were also given the opportunity to share with one another about how they encounter certain issues in their ministries. It was amazing to me to see that all these bishops from so many diverse cultures and backgrounds were facing so many of the exact same leadership issues with our flocks. Be on fire! You become a bishop and you have not led one soul to the Lord. An underlying theme of our hosts (the Kenyans) here at the Global Anglican Futures Conference is the East African Rival which spread rapidly in the 1930's. A spontaneous outpouring of the Holy Spirit changed this part of the world as churches were revived and new converts to the Faith began to live out and broadcast the Biblical message. It literally changed the whole culture. Of course, no revival is the same and they happen when and how God wants one. But we at GAFCON are praying for a fresh outpouring from God of His Holy Spirit to renew the Anglican Communion and reevangelize parts of the world which have departed from the Gospel. "Will you not revive us again?" reflects the plea of our hearts. * The Cross of Jesus -- the saving work of Jesus on the cross and his power to wash away our sins with emphasizing daily repentance and cleansing the heart through the blood of Jesus. * Confession and Repentance -- "in the open" with a confidence that the blood of Jesus cleanses from all sin and an intentional effort at putting things right with God and one's neighbor. * Obedience to the Authority of God's Word -- resisting any modern contention that the Bible was not the inspired Word of God. The Holy Spirit who inspired the Scripture is able to bring these Scriptures alive in our experience as a reliable guide in the life of discipleship. * Experience of Community - the churches shared a common fellowship and ministry as everyone set out to "Walk in the Light" with each other. * Personal Evangelism - led by lay missionary teams of Africans who went about spreading the Gospel by telling their own conversion story and trusting in the power of the Holy Spirit for effective ministry. May each soul be rekindled, with fire from above. Hallelujah! Thine the Glory, Hallelujah Amen! Hallelujah! Thine the Glory, Revive us again. 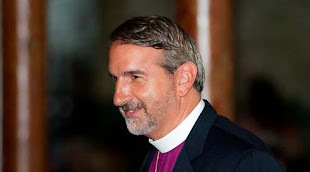 One of the important aspects of the Global Anglican Futures Conference is the world-wide perspective one gains, not just of Anglicanism, but of Christianity. It is most endearing and most challenging. Those of us in the West may be suffering the disabling of the Christian worldview by the government, the press, the media, and education system, but Christians in other parts of the world are losing their property, their lives, their freedoms, and their families --- just because they are Christians. We have heard stories from around the globe of intense persecution and immense suffering placed on our brothers and sisters in Christ. Ben Kwashi, Archbishop of Jos, Nigeria said this: "We are to so enjoy our sufferings that those who come after us will want to follow Jesus." Dr. Patrick Sookhdeo and the Barnabus Fund (www.barnabasfund.org) have published this prayer which I commend to you. may the rivers not overwhelm them. may the flames not consume them. Your deliverance, for they are in danger. and the conspiracies of men. There to reign with you forever. There are 1400 Anglicans here in Nairobi from over 40 nations, 27 Provinces of the Anglican Communion, 331 bishops, and a host of wonderful volunteers from All Saints' Cathedral. The pace is absolutely exhausting, yet filled with refreshing teaching and stories about the work of the Lord all around the world. It has been good to spend time with colleagues from the Anglican Church in North America and to meet godly men and women from around the world. In a recent session with bishops, it was incredibly amazing how regardless of background and culture, we are facing so many of the same issues in our ministries. Our team from the Anglican Diocese of the South are learning, sharing, and networking for the Cause of the Gospel of Jesus. P.S. Internet here at the hotel is spotty and slow so Internet Work is going slow. More updates to come. Allison and I have just arrived for the Global Anglican Future Conference in Nairobi, Kenya. We are gathering with Anglican leaders from all over the world for worship, fellowship, discipleship, and strategy for reaching the world with the Good News of Jesus Christ. Our prayer is that God will have His way among us and use this time to further the purposes of His Incredible Kingdom. Prayer is an incredible gift from God to those who desire His Presence in their lives. Prayer is the way God has given us to commune and have fellowship with Him. Prayer is the method to invite God into one’s concerns and needs in life. Imagine for a moment that a friend offers you a vacation (free of charge) to the destination of your choice and the length of time you wanted to be there. However, there is one catch --- you have to ask. Would you ask? I know… enough of us have seen the scams offering a free cruise or a weekend in the Bahamas. But what if this was a real thing, no strings attached. Just ask. Would you ask? Many people are not willing to ask God for help, for His blessing, for His guidance, for His wisdom, for His healing, for His peace, for His forgiveness, for love. For whatever reason, they just are not willing to come to Him and ask. James 4:2 says - “You do not have, because you do not ask God.” Jesus encouraged His followers to ask of the Lord: “I say to you: Ask and it will be given to you; seek and you will find; knock and the door will be opened to you. For everyone who asks receives; he who seeks finds; and to him who knocks, the door will be opened.” (NIV) And yet, many of us will not ask the Lord. Intercessory Prayer is asking of God on behalf of others. It is a bringing of their needs to Him and asking God for help. It is bringing their concerns and issues into the Presence of the Lord, and asking on their behalf. It can be as simple as asking for a solution to a problem or as serious as the salvation of someone’s soul. Start to work on your prayer-life. Learn how to turn to the Lord and accomplish His Will through intercessory prayer. If you have trouble praying for your own needs, then start by praying for someone else’s needs. Keep a simple list and track the answers you receive. You will be amazed!